Waiting to pick-up your car from the mechanic? Stuck in the doctor’s waiting room? Sitting around for the call to board the plane? If you got your kids with you and an iPhone there lots of ways to kill chunks of time. A couple of apps that I’ve been playing with that are both fun and actually help the kids with spelling and vocabulary are Boggle and Hangman. My son and I are hooked on Boggle big time. We’ve been playing the analog version for several months and the iPhone app version is a well-constructed, easy-to-play, and arguably a more fun way to go. What’s great about it is that after your turn, you can see all the possible words from letters you’ve rolled – which can be encouraging and also very humbling. You can scroll through the list of all the possible words and actually learn new oness (um… ilia? sigil?). Also, it tracks your performance, scores, word averages, etc plus there are levels you can unlock and other fun little extras. 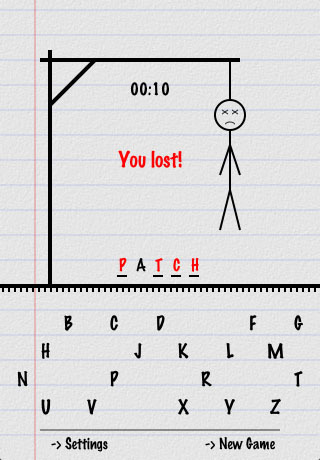 Hangman is also a fun and guilt free time killer allowing you and the kiddies to use the noggin to not only spell the words but figure out what the word is. The timer adds another dimension on which to compete. So simple yet can keep everybody engaged for quite a bit of time. If you can get over the essential morbidness of the game’s premise – you’re good to go. There are lots of versions out there but my favorite is the plain old classic version. It’s not a game but I have to give a short shout-out for Shazam. My son now launches it almost everytime he hears a song and the app, which is able to recognize the song and provide a name of the track, the band/artist and the album it’s from, is down right awesome.